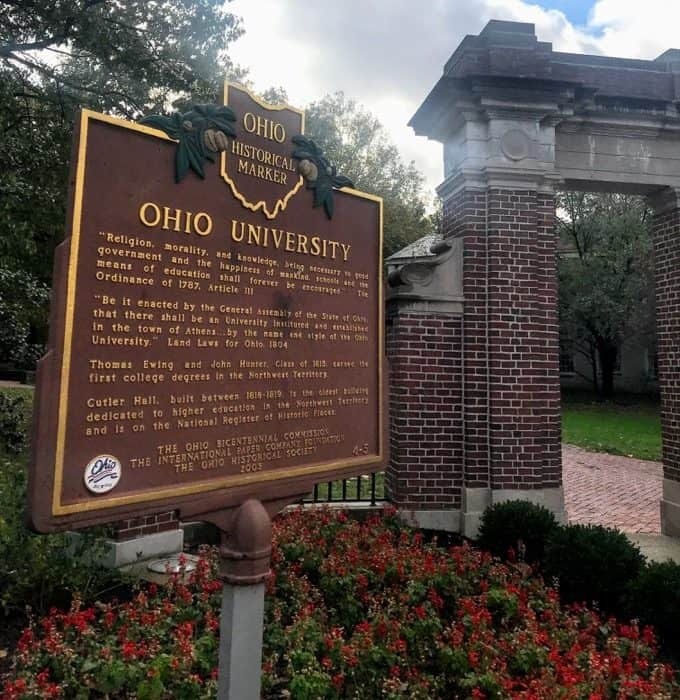 Athens, Ohio has been described to me as a hippy college community where many students fall in love with the area so much that they end up staying. In fact, many adults love the vitality of being around the college atmosphere even if they were never alumni themselves. 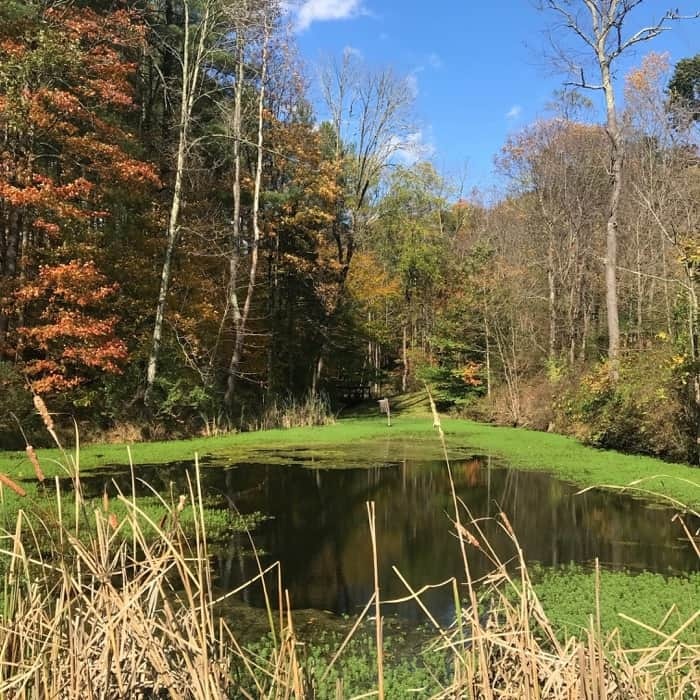 Located in southeastern Ohio along the Hocking River, Athens is surrounded by beautiful mountainous scenery with access to incredible hiking at nearby Hocking Hills along with a community that has maintained a passion for serving up locally served food long before it was trendy. 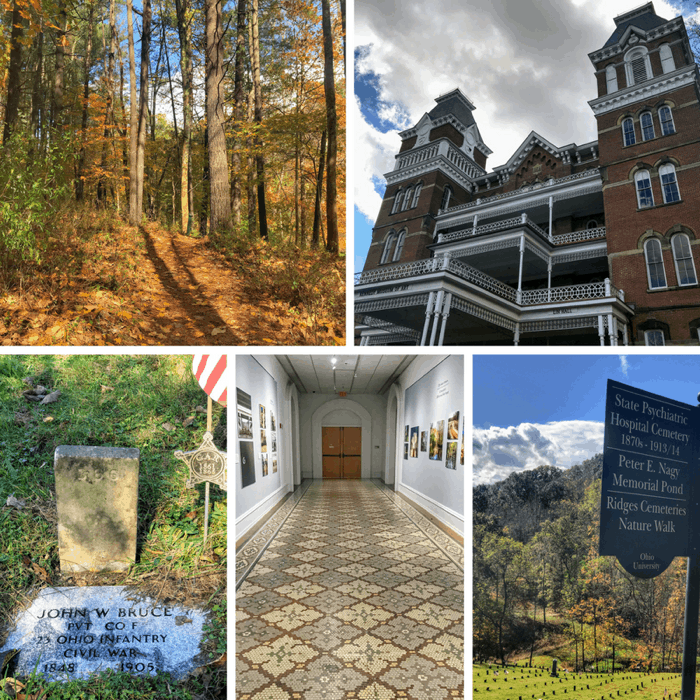 During a visit, you will want to explore The Ridges, formerly the Athens Asylum that dates back to 1874. The architecture on the outside invites you to want to learn more about what happened on the inside during a time when there was not as much known about mental health. 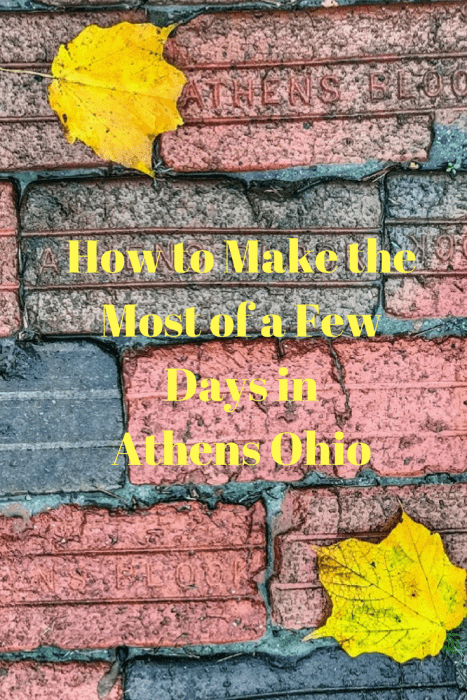 There are several special 2 hour Athens Asylum walking tours offered throughout the year for a more in-depth look at the history of the building and its former residents. Art lovers can enjoy the Kennedy Museum of Art gallery for free and then take a walk on the Cemetery Nature Trail and explore the nearly 700-acre grounds of the former hospital where you will see the gravesites of former patients and great views from 4 different trails. 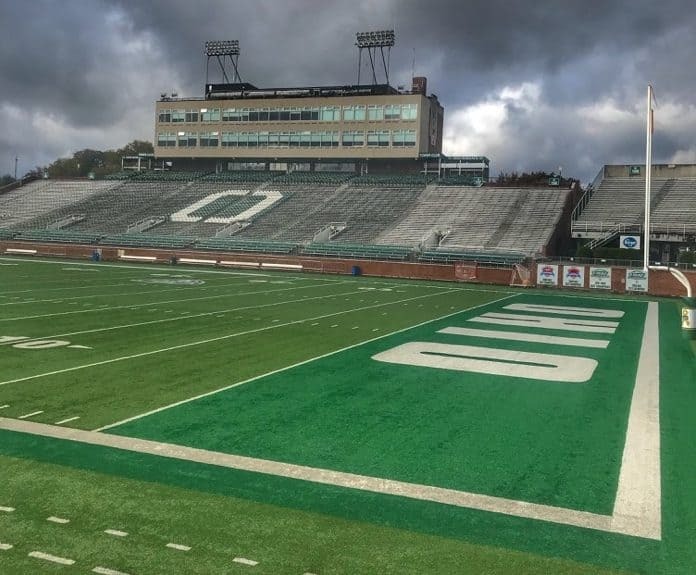 We tend to gravitate toward the football stadiums when we visit a college campus because my husband is a huge football fan but we also enjoy walking around to look at the architecture and gain more of a sense of the campus vibe. The University of Ohio campus is steps away from the Uptown Athens downtown with lots of unique shops and places to eat. 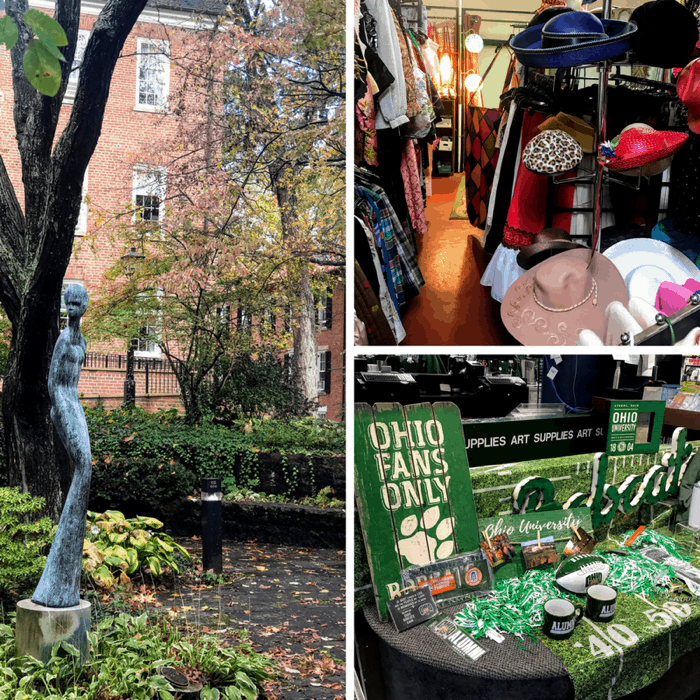 A few of the highlights were the Athens Underground for one of kind vintage treasures, Mountain Laurel, Import House, and Artifacts Gallery for local and quirky gifts. One of the downtown stops that absolutely captured my heart was Passion Works Studio. 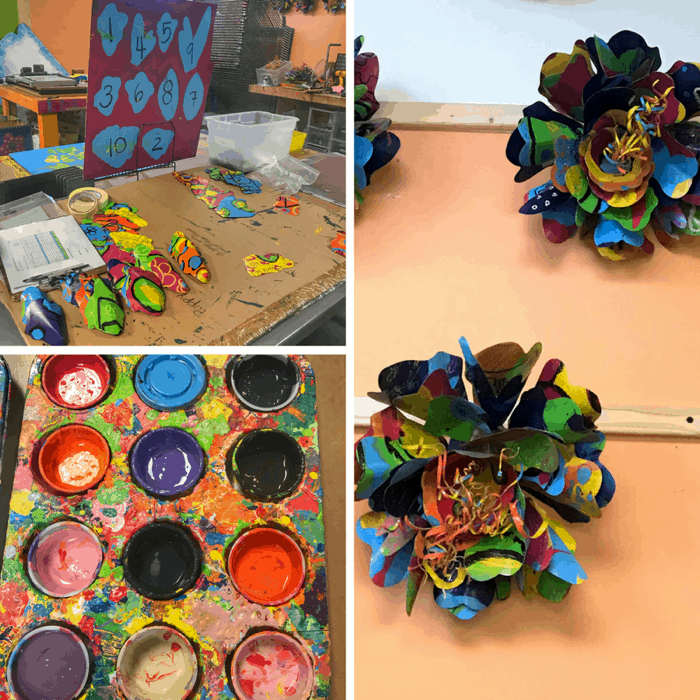 When an organization combines a love of art and a love for adults with special needs, you know you are in a special place. 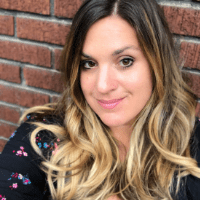 Their mission is to invite makers of all abilities to work and thrive within partnerships celebrating the power of creativity, connection, and purpose. They are also home to Athen’s official flower the “Passion Flower” created from recycled aluminum printing plates from the local newspapers that are handpainted by artists of all types of abilities. You can purchase the passion flowers at the studio or online. 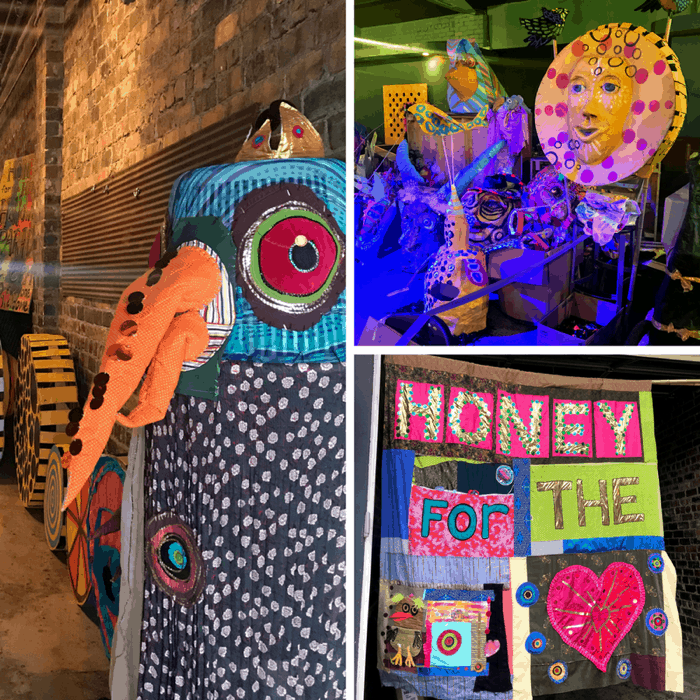 Another extension of Passion Works Studio is Honey for the Heart whose mission is to use repurposed materials (things perceived as junk) and morph them into fantastical larger than life puppets that dance in parades, festivals…or unexpectedly appear at community events. During our visit, I was invited to stop by and check out the volunteers in action as they prepared for an upcoming Athens community parade. Their creativity was very inspirational and inclusive to anyone who wanted to help create. 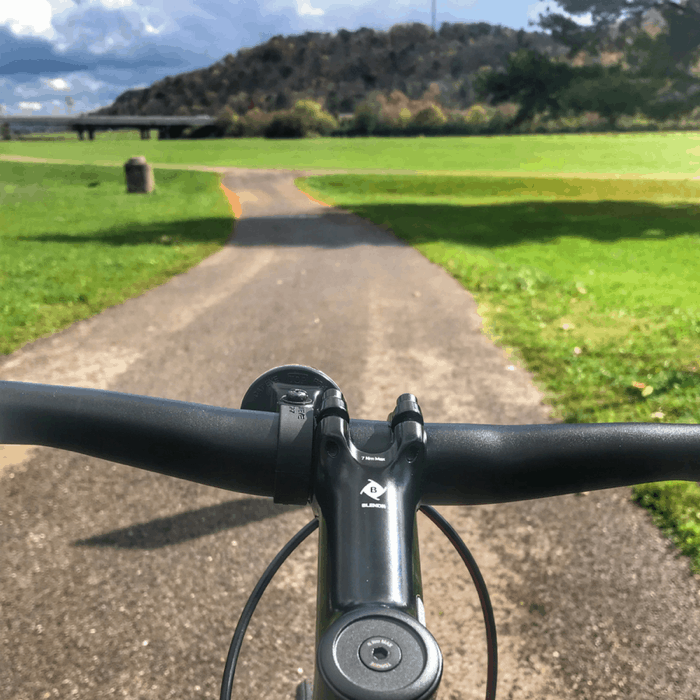 Stop by Athens Bicycle to rent a bike to use on the trail or find one that you may want to purchase along with lots of accessories to choose from. You can burn calories while on the quest to discover your favorite Athen’s brew. 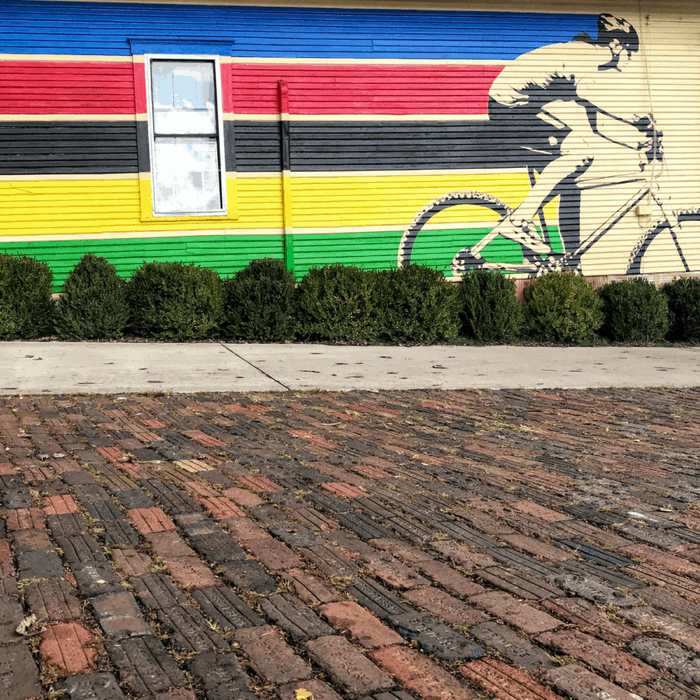 The Brewed on the Bikeway 21 mile bike trail connects you to several award-winning local craft breweries and a cider house in town. We didn’t get to visit all of the stops on the trail but we did make it to a few. Jackie O’s Taproom & Production Brewery is an easy stop to get to off the bike trail from Athens Bicycle. 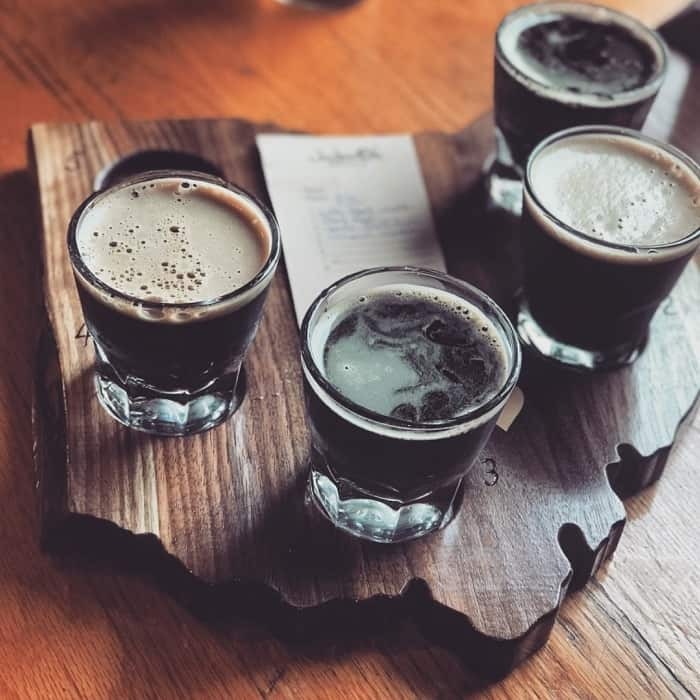 I absolutely loved the wooden Ohio shaped flight holder and with 38 signature draft beers, you are bound to find more than a few favorites. 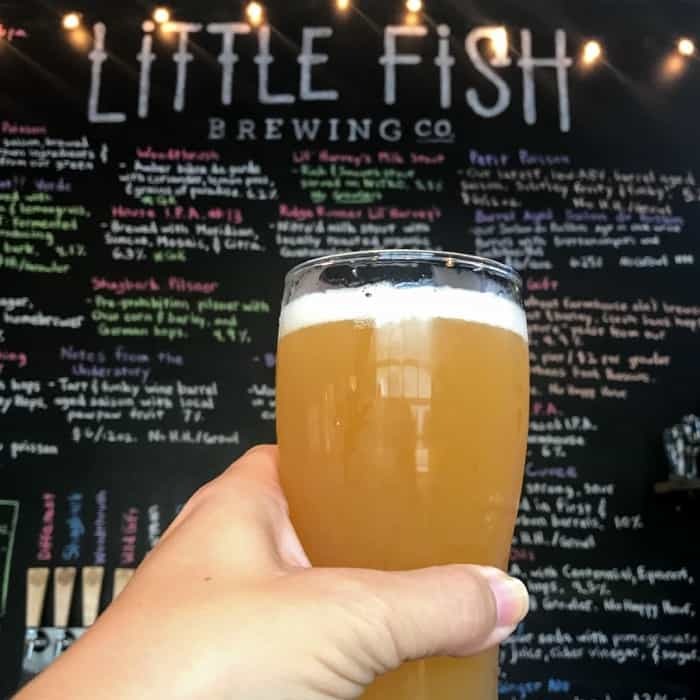 Little Fish Brewery Company is another stop off the bike trail that is very family friendly with a nice outdoor space where kids can play and parents can enjoy a drink. My husband ordered the House IPA and I tried the delicious Shrubbery which is a non-alcoholic drink with sweet and sour soda with pomegranate and blueberry juice, cider vinegar, and sugar. 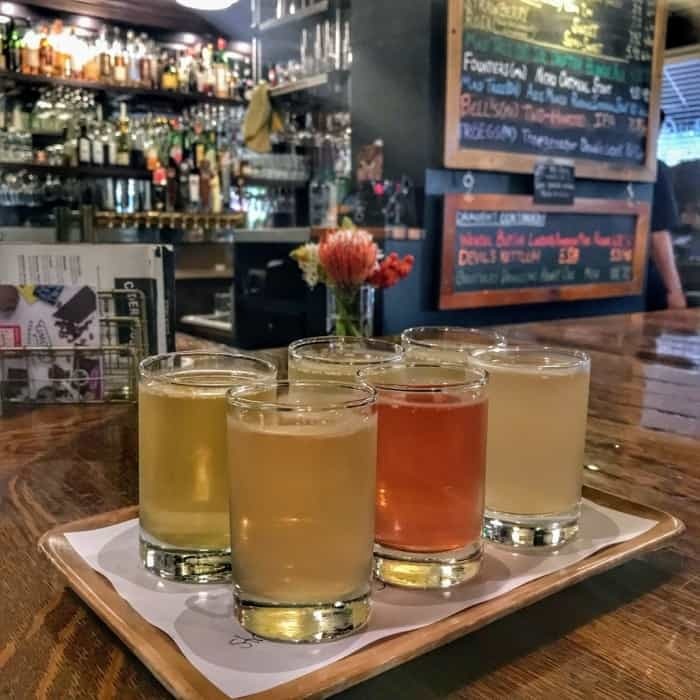 My husband and I shared a flight at another stop off the trail at West End Cider House to discover our favorite Ohio craft ciders. Beer drinkers and wine and cocktail lovers will still find several options to choose from as well. Our favorite from the flight was the Zingiber. You can’t visit a college town without checking out a local coffee shop. 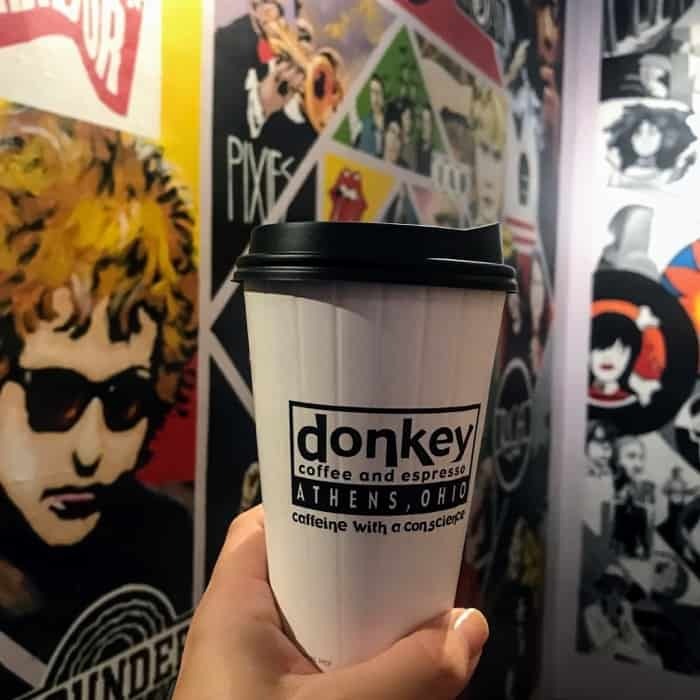 Voted Best Coffeehouse in Ohio, Donkey Coffee and Espresso did not disappoint with fair trade coffee, local goodies, and a nice selection of non-coffee options. Normally I would have chosen coffee but they had me really intrigued with the “CHAIDER” which was a delicious fusion of Chai Tea and Apple Cider. There is plenty of seating on the main floor and the 2nd floor has additional seating and a covered patio area with tables. 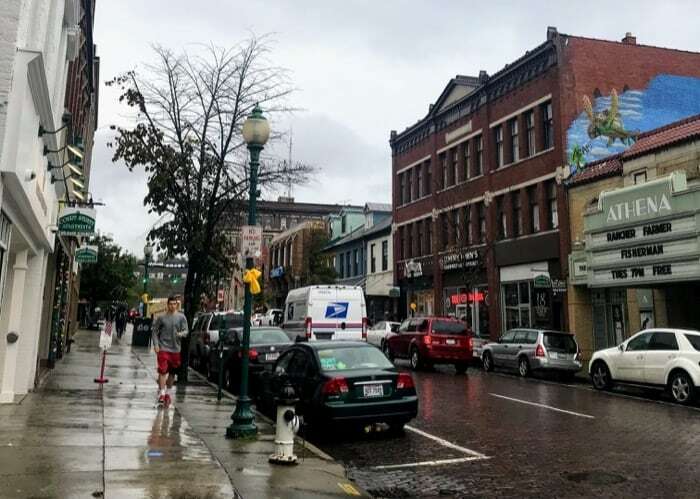 Locally sourced is a big part of the culture in Athens, Ohio and many restaurants in the area take pride in providing as many ingredients as possible within a 30-mile radius. There are a few things about Casa Nueva that will blow your mind. First, the food is fresh, sourcing as much as possible within a 30-mile radius, 2nd, the service is fantastic but they do not accept tips. I only knew about this detail because of some online research. It’s so rare to have full table service and not tip and still get amazing service. I had to ask our waitress because I was so intrigued by the concept. I asked her why she chose to work there instead of another tradition tipping restaurant. She said that the culture was like family, everyone works hard and co-owns, and that food perks are great. I have to agree with her on the food because the square-shaped burritos were unforgettable in shape and taste! We even tried a seasonal “Smackdown” brownie dessert even though we were already beyond stuffed. 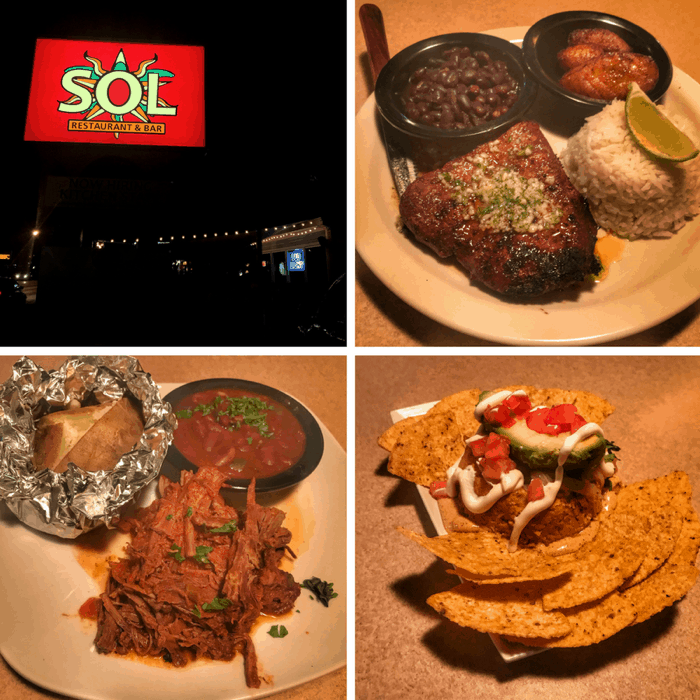 Specializing in Traditional American and Caribbean inspired cuisine, Sol Restaurant and Bar offers flavors that will make you almost forget that you are in Ohio. 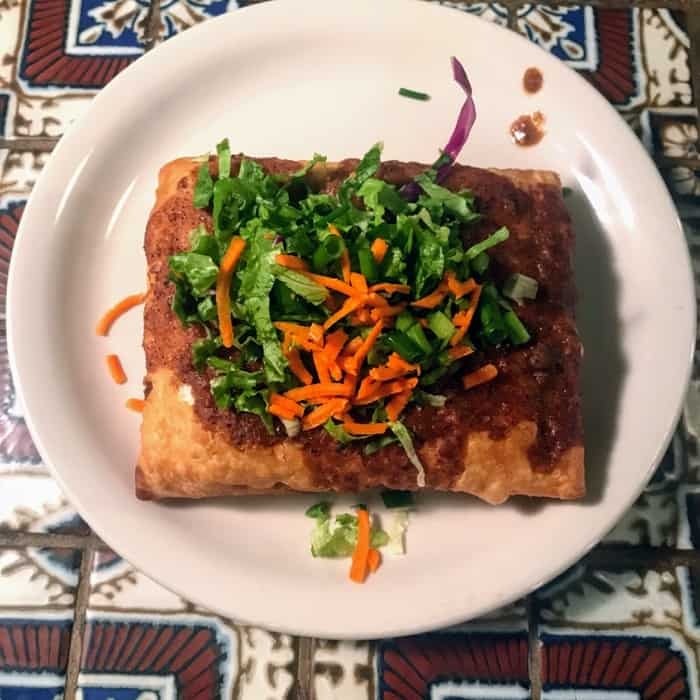 During our visit, we tried the Loaded Tamale (Cuban tamale topped with fresh avocado, tomato, sautéed onions, sour cream, spicy Diablo sauce, cilantro. Served with Shagbark tortilla chips.) the Ropa Vieja (Braised shredded beef, seasoned with wine, tomato sauce, onions, green peppers, and garlic served with white rice and black beans) and the Sol Steak with Chimichurri, which is their version of an Argentinean steakhouse classic served with a side of chimichurri sauce, and your choice of two sides with white rice. This is home to what might be one of my all-time favorite breakfast bagel sandwiches. My sandwich was the “MacGyger”, a jalapeño bagel, hard boiled eggs, pepper jack cheese, avocado, bacon, lettuce, tomato, and mayo. 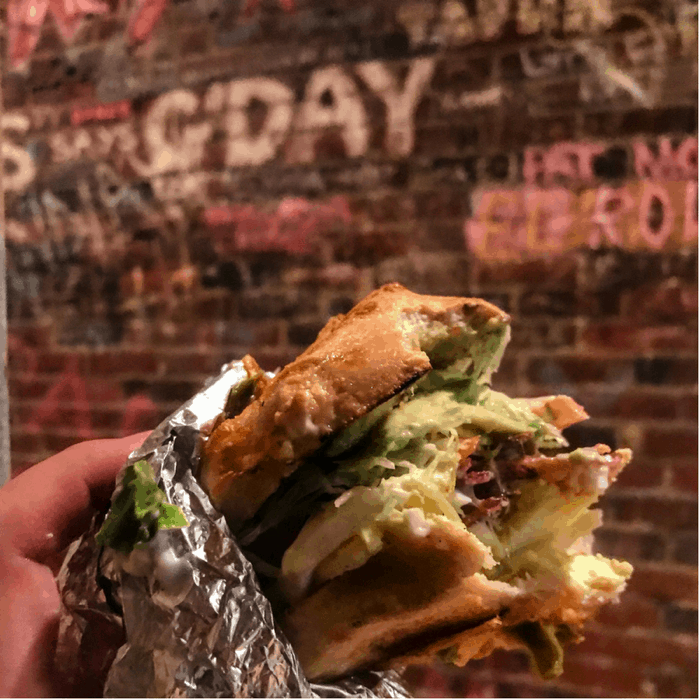 Customers line up to order their favorite named combination or can create one of their own and while you wait you can add your name to join the collection of customers whose names also grace the walls. This is definitely a unique stop for an even more unique hot dog. The hot dog combinations are clever in name and flavors which makes for an unforgettable meal. 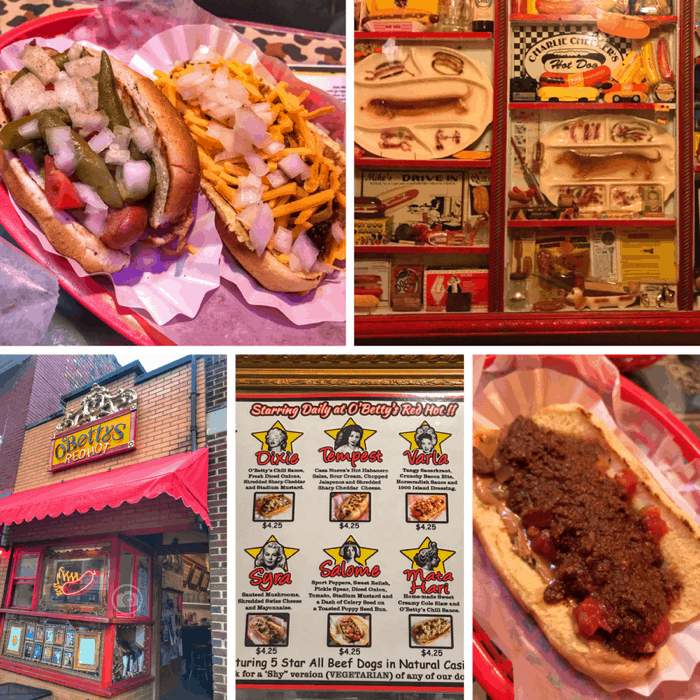 O’Betty’s Red Hot is also home to a small hot dog museum displaying a range of items with a hot dog theme. I ordered a popular “off the menu” item called the Taj Mai, bacon-wrapped all beef hot dog with peanut butter, chili and habanero salsa. I would have never put this combination together but it worked well. I encourage you to try a combination that is a bit outside of your comfort zone. 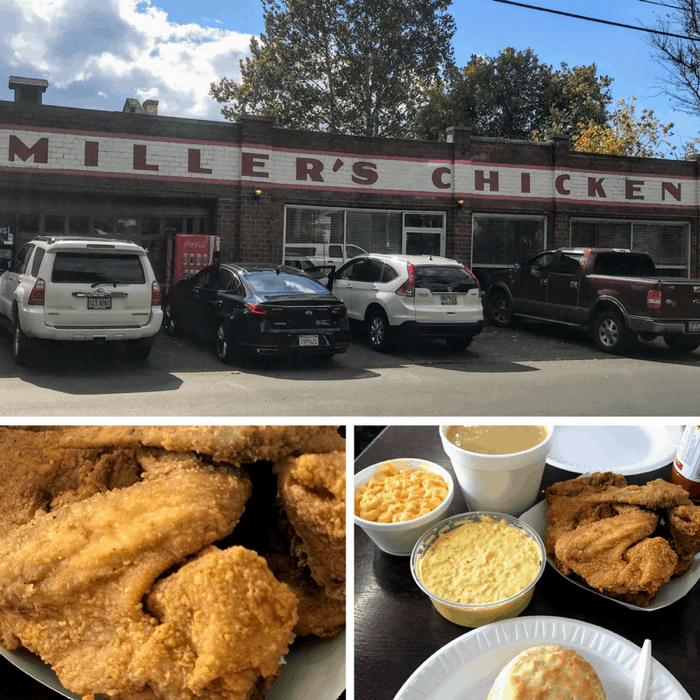 Another staple in Athens is Miller’s Chicken. The fried chicken and sides are served in a small dining room or by carryout with no frills because their fried chicken is just that good on its own. If you do order sides, I suggest the mac n’ cheese and coleslaw. 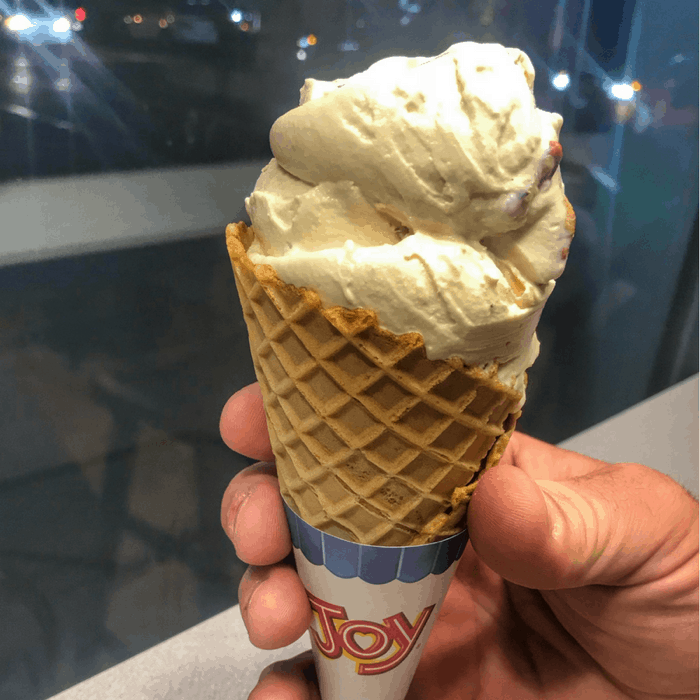 Two other popular spots if you are having a craving for sweets are Whit’s Frozen Custard with fresh frozen custard made daily and McHappy’s Donuts and Bake Shoppe with a commitment to products that are free of preservatives and trans-fats. 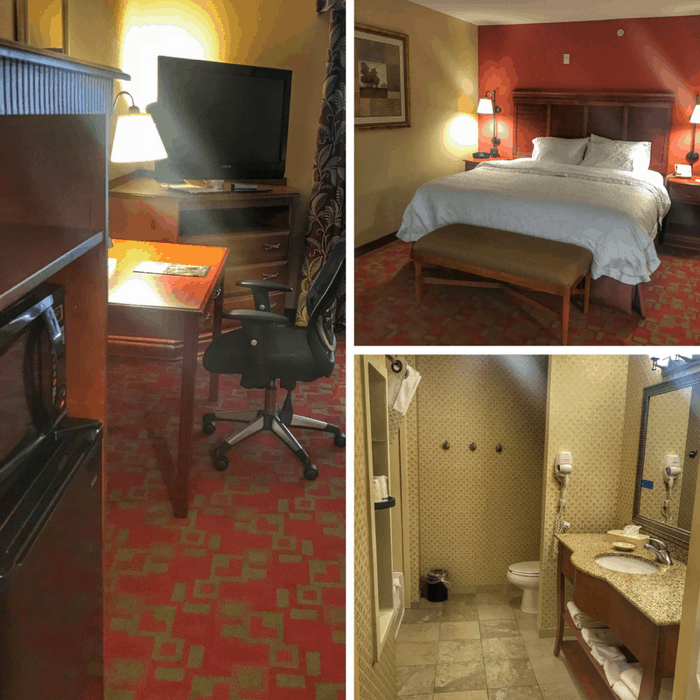 During our visit, we stayed at the Hampton Inn in Athens which was extremely convenient for all of our adventures. 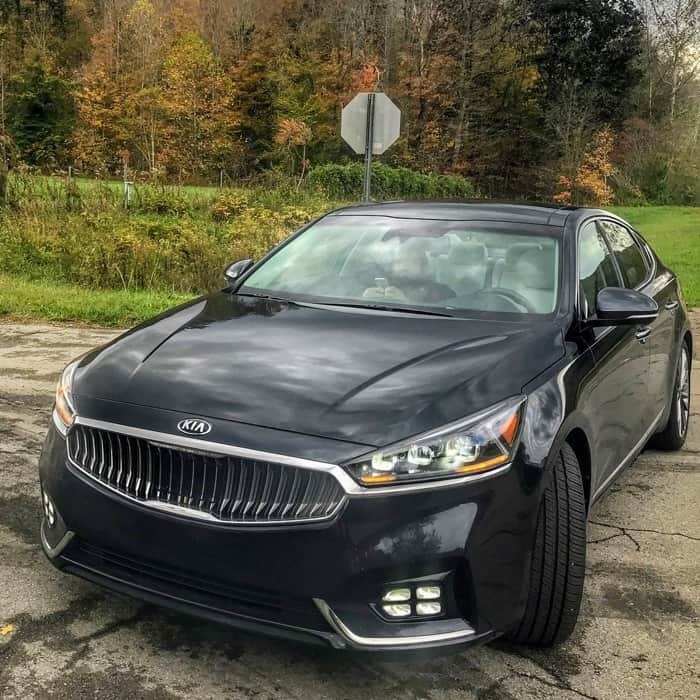 For our road trip to Athens, we enjoyed test driving the KIA Cadenza with a large moonroof, great leg room in the front and back seat, and an all-around luxury experience in style and additional features. My favorite feature was the odometer projection on the windshield with the posted speed limit. Visitors to Athens will find great locally sourced food and drinks along with outdoor adventure centered around a great college community. 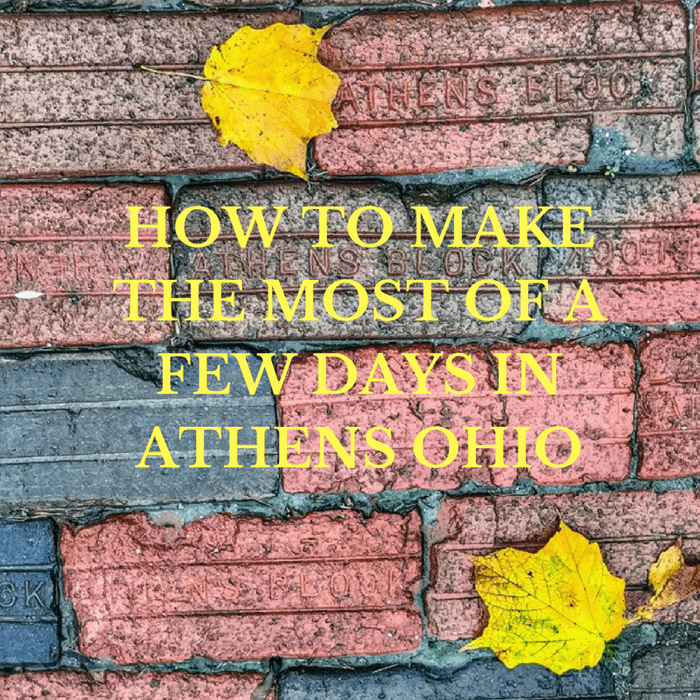 A few days in Athens helped me understand why alumni cherish it so much. Thanks again to Visit Athens for hosting our visit and KIA for providing our road trip vehicle. All opinions are my own. Thank you so much for sharing that Lori! And I still dream about that bagel sandwich! Thanks Nancy! We were kid-free during our visit so I’ll be interested to hear what’s on your list.